A press release from the Order of Malta a few weeks ago broke the news that “Caritas Pro Vitae Gradu”, CPVG, a charitable trust set up in New Zealand that was talked about a lot last year for having had its assets frozen for about five years by the public prosecutor of Geneva, has resumed making donations. And it has earmarked the first for the Lebanese Association of the Order of Malta, headed by Marwan Sehnaoui, and for the Lebanese Foundation of the Order of Malta, also headed by Sehnaoui. The project for which the funds are destined is a humanitarian effort of assistance and organization for summer camps for young Lebanese with physical and mental disabilities. But let’s take a few steps backward. At the end of March 2017 Settimo Cielo published details on several statements contained in a press release from the Order of Malta. These details have never been denied. So let’s review the sequence of events. – In 2012, Mr. Marc Odendall, without any position of authority in the Knights of Malta, agrees with the “trustee,” the fiduciary of the CPVG, on several donations on behalf of branches of the Order, indicating among these a foundation headed by Archbishop Silvano Tomasi, at the time the Vatican nuncio at the United Nations in Geneva, a foundation that in reality had nothing to do with the Order itself, but of which Odendall was treasurer. – In 2013, two physical persons bring criminal complaints against the fiduciary of the CPVG, for a presumed misappropriation of funds from an inheritance willed to them. 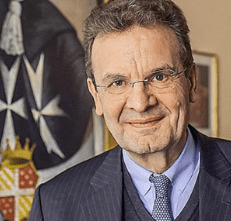 The prosecutor in Geneva opens a criminal proceeding against persons unknown for “unfair management practices, abuse of trust, and money laundering.” The Order of Malta and another religious institution are associated in the proceeding. The CPVG trust is alleged to be in the possession, after numerous not perfectly traceable transactions, of 120 million Swiss francs, originally from a foundation in Liechstenstein called “Malta Stiftung,” 25 percent of which the owner is said to have intended for the Order of Malta. – In the period from 2013 to 2016 Marc Odendall, Archbishop Tomasi and Marwan Sehnaoui, together with German baron Albrecht Freiherr von Boeselager (in the photo), first Hospitaller and then Chancellor of the Order of Malta, exert all possible pressure on the Grand Master of the Order at the time, Fra’ Matthew Festing, to enact a transaction with the fiduciary of the CPVG. The Grand Master, however, blocks any agreement, in expectation of a ruling from the Swiss judiciary. – On December 6, 2016 the Order opens a disciplinary proceeding on Boeselager, for a distribution of contraceptives and abortifacient pills in the Order’s aid projects in Myanmar and South Sudan. Boeselager is suspended from the Order, and therefore removed from the position of Chancellor. – On December 21, 2016 the Holy See, which in the meantime nominated Boeselager’s brother Georg as advisor of the IOR, the Institute for Works of Religion, the Vatican “bank,” institutes a committee of inquiry into the activities of the Grand Master. As members of this committee it calls Marc Odendall, Archbishop Silvano Tomasi, and Marwan Sehnaoui. – On January 14, 2017 the Grand Master denounces the evident conflict of interest on the committee and announces the constitution of a professional internal committee to shed light on this conflict of interest and the CPVG trust. – On January 24, 2017 Pope Francis summons the Grand Master to the apostolic palace and forces him to resign. The Order of Malta is a sovereign body recognized internationally. The event appears to many as an abuse that undermines the sovereignty of the Order. – On January 25, cardinal secretary of state Pietro Parolin sends a letter informing the members of the Sovereign Council of the Order that the Holy Father has accepted the Grand Master’s resignation and that “on the basis of evidence that has emerged from the information acquired from him [through the committee? – editor’s note] he has determined that all the actions taken by the Grand Master after December 6, 2016 are null and invalid. The same goes for those of the Sovereign Council.” Boeselager thus goes back to being Chancellor. – On March 1 the new “management” of the Order signs a transaction with the fiduciary of the CPVG trust. The transaction stipulates donations to the Order for seven years. But the prosecutor in Geneva does not unfreeze the assets. – The Order commissions an investigation into the origin of those assets with an outside auditing firm, the Promontory Financial Group, whose response, never made public, figure as having been accepted by the Board of Auditors of the Order itself. But the Board of Auditors is a collegial body, while in reality the response is thought to have been accepted by a restricted “ad hoc” committee. – In December of 2017, the prosecutor in Geneva retires. The assets of the CPVG trust are unfrozen. And the first donation is to none other than the association headed by Marwan Sehnaoui. The devotees must be rewarded. Moreover there will soon be, on May 2 and 3 of 2018, the election of the new Grand Master or of the Lieutenant of, and it is natural to wonder for whom Senhaoui and others will vote. – On February 9, 2018 the statement from the order cited at the beginning thanks Archbishop Tomasi and Marc Odendall “for having facilitated good relations with the fiduciaries of the trust since 2012.” The clique that defenestrated Grand Master Festing is therefore more firmly in the saddle than ever. The two Boeselager brothers now control both the Vatican finances (at their last gasp) and the finances of the Order of Malta (thanks in part to the silent seizure of assets donated by Italian families to Italian branches of the Order), as well as the money of the New Zealand trust that has come to the Order by such a tortuous route. Meanwhile, within the Order, this German-driven “differently legitimate” management is pulling the strings of a process of constitutional revision. All those who do not align themselves with the dominant course are excluded from the process and from the discussions, disqualified as fomenters of division. Already in the past, in 1798, the Order of the Knights of Malta ended up being destroyed. This was done through the cowardice of the Grand Master at the time, the German – he as well – Ferdinand von Hompesch zu Bolheim, who gave in to Napoleon’s browbeating. It took at least thirty years to reconstruct the Order. But the constitutional revision that is underway is another story. That will be part of a future discussion. It can be added that last February 17 Pope Francis received in private audience – not marked down in the official bulletin of visits – the president of the Lebanese Knights of Malta, Marwan Sehnaoui, as it appears from the photos of the meeting taken by the Vatican Photographic Service. My phone messed up. Anyway, Francis, let you return the money! Organ harvesting and early killing is illegal and inmoral. There’s no escape from that fact.